After three years of being the minority, the Liberal Democratic Party (LDP) of Japan was finally able to regain power in the Japanese government. Over the weekend, the LDP, led by Shinzo Abe, won 294 seats in the 480-member parliament, while the Democratic Party of Japan (DPJ) captured only 57 seats. One might think that the LDP had won due to a spectacular platform or amazing credentials, but that couldn’t be further from the truth. The fact of the matter is, the LDP’s victory had a lot to do with the failure of the previous leadership than its own merits. During the DPJ’s reign, Japan’s economy suffered one economic blow after another that led to a massive decrease in the party’s popularity. Under the DPJ, Japan saw itself plunge into recession, fall deeper into deflation, suffer an earthquake-tsunami-nuclear crisis, and enter a territorial dispute with China. So, despite the LDP’s landslide victory, the result was generally expected by the market. Now that Abe is handling Japan’s reins, market players are expecting him to steer the economy away from deflation. More specifically, he’s expected to start making good on his promises to increase public works spending and to get the Bank of Japan (BOJ) to implement looser monetary policies. If Abe shows immediate progress in fulfilling his plans, the increased public works activities will provide short-term boost for the construction and materials industries. Not only that, but Japan’s exports, which contributes a huge chunk of the country’s GDP, will also get a lift once the BOJ gets around to further weakening the yen with its easier monetary policies. Given the recent developments, we can’t blame investors for wanting to sell the yen like the world is ending in a few days. After all, a win by the LDP is almost synonymous to weaker yen as Abe has been vocal about his calls for easier monetary policies all along. However, given the how strongly the yen has been weakening the last few days, it might be good to exercise caution on chasing a trend before a correction takes place. 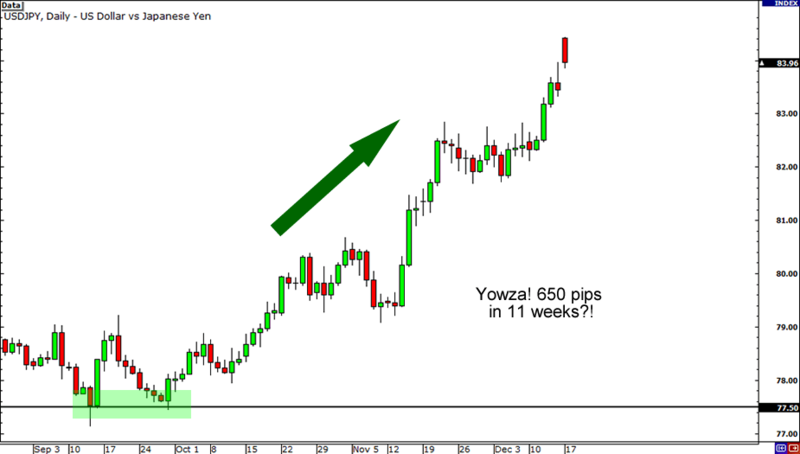 Heck, USD/JPY had already risen by 650 pips in the last 11 weeks alone! Don’t believe me? Check out the daily chart below! Also take note that we’re halfway through December, which means traders may begin taking profit and start closing up shop before the holidays. This could drag USD/JPY to its next potential support at around the 82.00 area. Don’t bet all your pips on it though. Stranger things have happened on the forex scene. Who knows? Maybe Abe will continue to come up with yen-bearish remarks that would push USD/JPY all the way to 87.00! The important thing is for you to consider all possibilities and keep a trading plan ready in case the yen’s scenario changes. What do you think will happen to USD/JPY next?